Our band Echoes in Rhythm featuring Sidney Barnes has been invited back to the Twisted Laurel Weaverville for a show on Fri. April 17th from 7:30 - 10:30 pm. and Sydney Barnes - vocals. Our first set at 7:30 will be instrumental and Sidney will join us for the two later sets. The Twisted Laurel Weaverville is at 10-A South Main Street in Weaverville. My long-time associate in spiritual work, Healer Ron Young is coming to the Asheville area for one of his extraordinary trainings May 7-12 (13) and is presenting an evening of healing meditation Tues. May 5th at Crystal Visions. I highly recommend his work and the May 5th evening is a perfect way to experience the blessings that by the Grace of God unfold uniquely for each individual. Sat. April 11, 4:15 - 5:00 pm, UNCA Faculty Jazz Group concert on the Quad. University of North Carolina - Asheville. Part of a student concert festival starting at noon. Fri. April 17th, 7:30 - 10:30 pm playing for Swing Dancing at the Weaverville Twisted Laurel 10-A South Main Street in Weaverville NC. The band is Echoes in Rhythm featuring vocalist Sidney Barnes. Thurs. 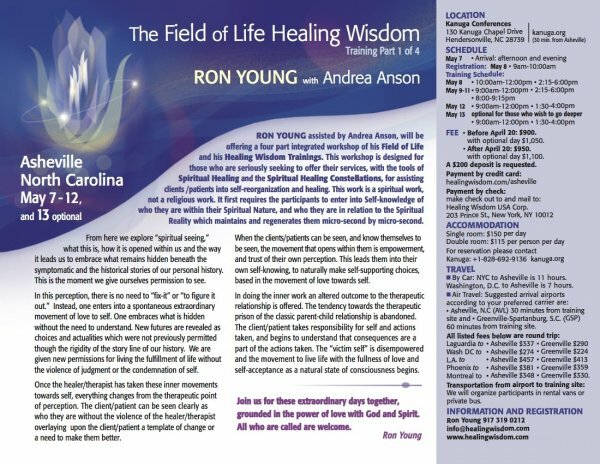 - Tues. May 7 - 12 (13th optional) Field of Life Healing Wisdom Training Part 1 of 4 with Ron Young at Kanuga Conference Center, Hendersonville, NC Click here for more info about this extra-ordinary event and to register. Anyone can learn to recognize the Divine in another person and reflect that Divinity back to them. This reflection can be expressed through music or any means of communication. In this experiential workshop, we will focus on recognizing and expressing Soul qualities in each other through the practice of discernment, conscious intent, surrender and Divine expression. Topics include the ability to shift one’s own consciousness quickly and easily, and the ability to resonate with and support the highest ideals present in a group. This teaching was developed from Richard’s twenty-eight years of creating Musical Soul Portraits for individuals, couples, and groups. Sat. 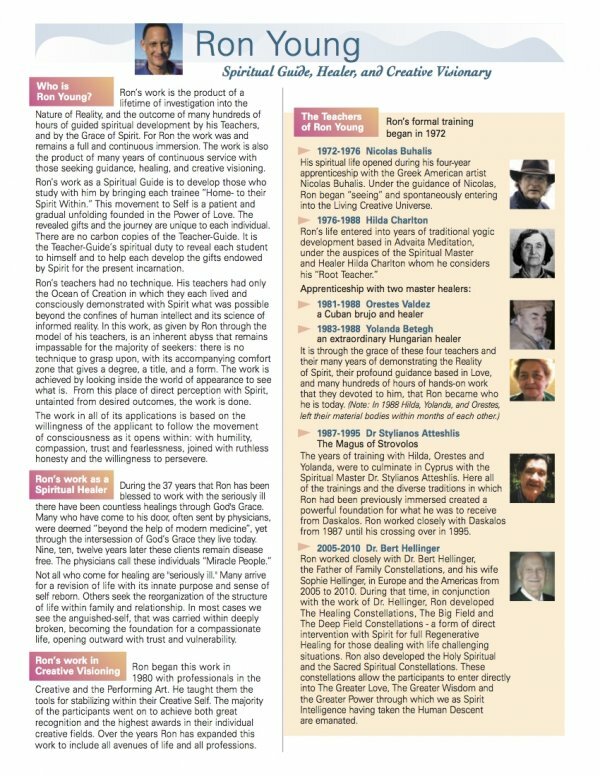 Aug 8 - Sun. 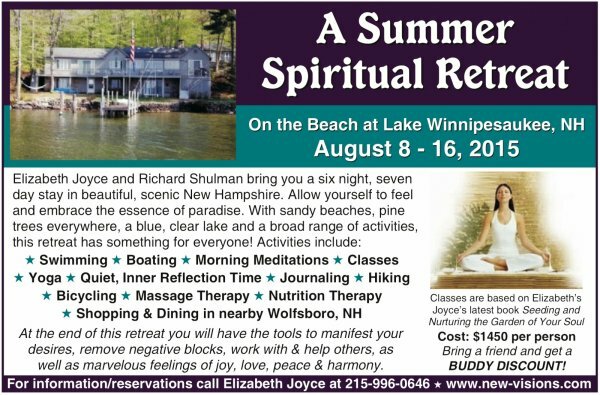 Aug. 16 "A Summer Spiritual Retreat in New Hampshire" with Elizabeth Joyce and Richard Shulman. for info, click here. I recently invited extra-ordinary healer and spiritual guide Ron Young to give one of his trainings here in Asheville and he will be here for two events in May. 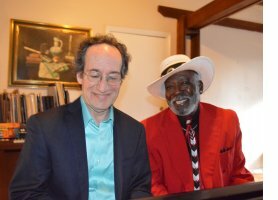 I have worked with him for over 30 years and he has been instrumental in my spiritual and musical accomplishments. I met Ron in 1983 during the time I began my immersion into the exploration of Spiritual Reality. At that time I was studying the yogic traditions of meditation and healing with Hilda Charlton. I came to Hilda as a jazz musician with classical roots. Hilda took me in, so to speak, assisting me in consciously developing my spiritual reality, and taught me to be an instrument of the Divine through the expression of music. At the same time Ron, who worked very closely with Hilda (and with her permission), worked with me to attune me to the Spirit-Soul level of individuals seeking healing. 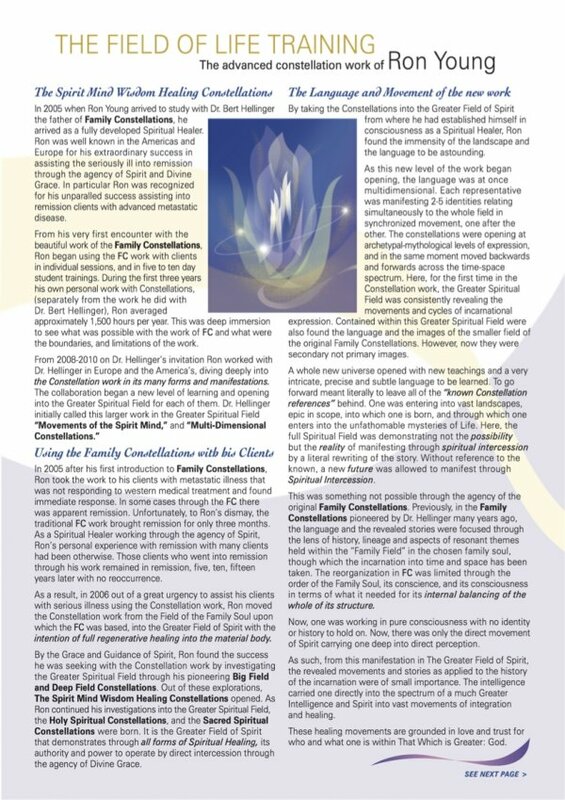 The spiritual work he guided me through was specifically to call forth the intelligence that the individual's Spirit-Soul was offering as a doorway to assist their entry into the reality of their Spirit-Soul and to receive both the healings and awakenings awaiting them from their inner nature. Ron called this work Soul Portraits. In the 29 years since then I have created hundreds of Musical Soul Portraits for individuals and groups as a form of healing and spiritual service. Many Spiritual gifts have come from the continuing work and collaboration Ron and I have enjoyed over the years. These include different albums and performances in Europe, the United States and Canada. Most importantly I have taken this connection of the Divine Creative Intelligence Ron assisted me with into my life directly and through the gift of music as an offering of continuous Spiritual Healing to the world in which we live. This is going to be a lovely and healing retreat with Elizabeth!